Meal prep is one of the most important things you can do to eat more nourishing, healthy, real food. It’s a keystone habit: one thing that makes a big difference, causing a ripple effect across your day, your week, and eventually your life. But the thing is, traditional meal prep can feel overwhelming, daunting, and downright tedious. We fall into the trap of thinking it has be complicated, time-consuming, and take hours upon hours of slaving away in the kitchen. The good news? It doesn’t have to be that way. Adding a little intentionality to your meal prep, and approaching the process incrementally will allow you to find more ease and efficiency. And when you simplify, the whole thing just becomes easier. 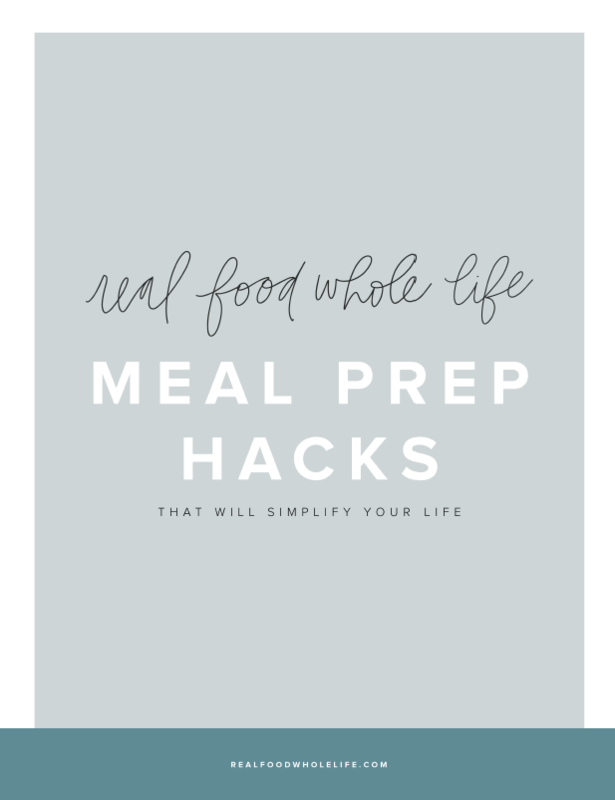 Be sure to grab the free cheatsheet below, then read on for 6 essential meal prep hacks that will simplify the process. Downlaod the free cheatsheet to help you simplify meal prep. No spam, just love headed your way. As is in starting with one thing and building from there. Roast a batch of veggies. Make lunch for the week. Start with one, and build momentum from there. Try It: Roast a batch of veggies or make lunch for the week. 2. A Little As You Go. Instead of looking to carve out an hour (or several), try prepping a little as you go. Boil some eggs alongside your tea kettle. Make a double batch of pulled chicken for dinner, then use leftovers for another meal later in the week. Try It: Make a double batch of pulled chicken. Here’s the thing: having a flexible plan for the week, or a meal map, will help you prep with purpose. Making sure you have the right groceries on hand is half the battle, so map out your week before heading to the store, and then prep a little to give your meals a much-needed jumpstart. Here’s a free simplified grocery list to get you started! Thing of your meals in terms of the Essential Six: protein, sauce, cooked veggies, raw veggies, grains/bases, and toppings/extras. Combining these six parts allows you endless variety, plus a chance to prep just one part. Make a big batch of base/grains, cook up some protein, or stir up a sauce or two. Now that’s meal prep simplified. Try It: Make a big batch of base/grains, cook up some protein, or stir up a sauce or two. Let that slow cooker or pressure cooker work for you. Throw in some beans or protein, hit start and walk away. With very little work you’ll have a couple of proteins prepped for the week. Try It: Prepare some slow cooker beans or protein this week. 6. More of the Same. Hey, we don’t have to reinvent the wheel every single week. Have a go-to make ahead breakfast you love? Or a hearty salad the sustains you through the day? Put those on your permanent prep list. Yes, variety is great, but so is ease. Bonus points: create a corresponding grocery list that goes alongside, so you’ll always know what to buy and have what you need on hand. Try It: Find a breakfast or hearty salad and prep it every week. pin this image to save meal prep hacks that will simplify your life for later! More Simplified Meal Planning You'll Love! Simplifying meal prep & planning is an absolute game changer when it comes to eating beautiful, real, healthy food. Because meal prep & planning doesn’t have to be complicated, boring, or time consuming. Read on for the Simplified Guide to Meal Planning & Prep. Simplifying meal planning and prep takes a some upfront work, and also requires a mindset shift. The time and work to learn a new process and shift your thinking is so worth it, though, as it will allow you to streamline, reduce decision fatigue, and create time and space for what you really love. but first, grab your free simplified guide to meal planning & prep! Let's take this next level! Enter your name & email and we'll send you the free guide. Designating time and space for meal prep & planning allows you to streamline the entire process of eating healthy, vibrant, real food, saving you precious time, money, and wasted effort in the long term. Deciding what to make for dinner and gathering the correct ingredients requires mental energy better spent on other things. By simplifying the process, you’ll reduce decision fatigue and have more mental energy for the things that matter most. Simplifying means less time spent on scrambling at the last minute, which means you’ll have more time and space for what you love, while still enjoying beautiful, healthy food, everyday. The first step in simplifying meal prep & planning is creating a clean, organized space. Creating a Capsule Pantry is a great place to start when you’re ready to simplify. Similar to a capsule wardrobe, a capsule pantry is made up of a limited number of versatile ingredients that you’ll love to eat, and that can be combined into a variety of easy, delicious meals. Now that you’ve created space, it’s time to get organized. Focus on adding back the essentials so that you can create versatile real food meals with ease. Gather ingredients and organize them by type. For example, group proteins together in the freezer, and place grains + bases together in the pantry. Prior to creating your grocery list, do a quick audit of your fridge, freezer & pantry to see what needs restocking. Then make your grocery list to fill in the gaps. Tip: Stock up on the essentials such as grains, beans, and protein when they go on sale, online, or at your local wholesale store. Freeze what you can’t use within a few days in individual serving sizes. Less is more when it comes simplifying real, healthy food. If your budget allows, invest in higher quality ingredients for maximum flavor. When it comes to simplified meal prep & planning, it’s all about ditching complicated plans and endless hours prepping. Simplifying starts with a 1-2-3 process. Here’s how to do it. Instead of relying on complicated recipes, focuses instead on meal types. By starting with meal types instead of rigid recipes, you’ll be able to create a loose plan that allows for greater flexibility and ease in the process. Focus on the building blocks of any recipe, or The Essential Six, which can be combined to create fresh new meal types each week. Simply select a meal type, then mix & match the Essential Six to create versatile, customized meals. 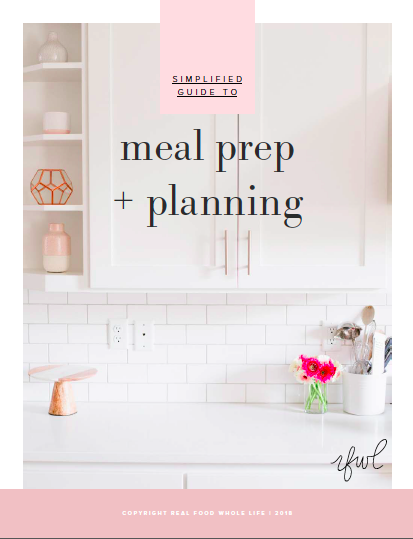 Scroll to the end of this post to grab your free guide to Simplify Meal Planning & Prep! Like meal planning, simplified meal prep doesn’t have to take hours. Streamline your process by focusing on prepping the Essential Six, then using the Mix-and-Match Method to prepare weeknight meals, effortlessly. If you only have a few minutes, consider preparing a few sauces for the week to keep in the fridge and add variety to any meal. With a little more time, try prepping some grains for bases for the week. Whip up a batch or two of protein, and you’re well on your way to streamlined weeknight meals. Like most things that matter, simplifying meal prep & planning takes time and a powerful mindset shift. Letting go of perfect when it comes to meal prep & planning will make all the difference in sustained, long term success. It doesn’t have to be perfect, or all-or-nothing. Start small. Meal map one day. Prep one thing. Do what you can and let the rest go. You’ve got this. What are your favorite ways to simplify meal planning? Share them below, and tag @realfoodwholelife on Instagram so I can see what you're up to! more simplified tips this way! Like a capsule wardrobe, a capsule pantry helps you simplify, streamline, and eat real, healthy food with ease. Here's how to do it. What is a capsule pantry? 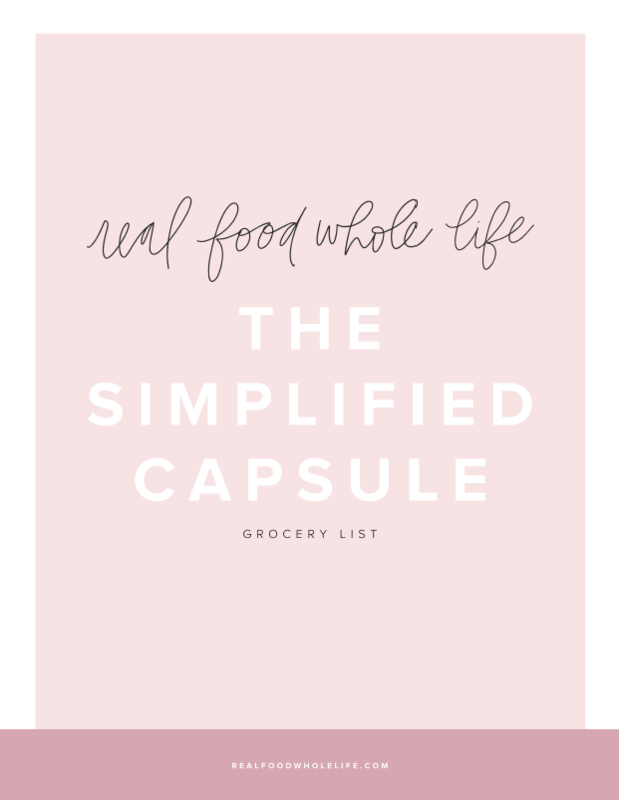 grab your free simplified capsule grocery list! What are the benefits of a capsule pantry? There are so many benefits of creating a capsule pantry! First, by putting thought into the specific items you keep on hand, you’ll be able to streamline grocery shopping and cooking. Second, you’ll reduce the number of decisions you need to make each week when it comes to meal prep, meal planning, and cooking. Finally, you’ll reduce food waste, because you’ll know how to use what you have on hand, instead of buying ingredients only to throw them away later on. Keep in mind that this is an iterative process, meaning that it takes a little time and exploration to work out the details. You’ll likely need to experiment with the exact items you want to keep on hand, as well as the specific ingredients that you’ll actually use. There is no magic number when it comes to creating a capsule pantry, rather it’s about finding the right balance of items that you’ll actually use, that lend enough variety to your cooking, and that you have room to store. Remember, this isn’t about perfection! Simplifying is about asking what you actually need, and then letting go of the rest. The first step in creating a capsule pantry is to declutter. To tackle the pantry and fridge, those two problem areas that cause alllllllllllllll the kitchen chaos (you know what I’m talking about)! Here’s the step-by-step on decluttering your pantry and fridge. Now that you’ve cleared the clutter, it’s time to start building your capsule pantry. Start by writing a grocery list of staples, those items that you know you use, week after week. I’ve created a simplified grocery list for you to use as a jumping off point. Tip: keep these ingredients on hand and you’ll be able to make about 95% of the recipes on Real Food Whole Life without needing to run to the grocery store for additional items. Download the simplified grocery list! Of course, my list will probably be different than yours, depending on your dietary preferences, and other factors. Feel free to use the list as a guide, and then adapt to your tastes and preferences. Bring your capsule grocery list to the store and make sure you’re referencing it as you fill your grocery cart. If it feels overwhelming to gather all the ingredients at once, simply start with one or two items per week, until your capsule feels complete. Tip: Stock up on capsule items when they go on sale, particularly shelf stable items that will last for a few months. Now that you have a capsule pantry, it’s time to start cooking! Plan simple meals using the ingredients on hand, substituting and adapting where necessary. Here are 20 capsule recipes using the Simplified Grocery List to get you started. Tip: You can make all of these recipes using the items on the Simplified Grocery List, plus a few extra ingredients depending on the recipe. Ready to ditched complicated meal planning in favor of a simple, streamlined system and streamlined? Here's how! It is something that's always on your to-do list but somehow never actually happens? Or is it something you dread because it seems time-consuming and boring? Trust me, I'm right there with you. For years meal planning was on my dreaded chore list, and even though I knew having a plan would change the game, I always avoided it. I was overwhelmed and out of balance, and between the demands of work and family, I struggled to find the time to get organized. I felt like I needed an extra 6 hours just to meal plan. And those were 6 hours I didn’t have. Of course, I tried complicated meal plans, but struggled with unwieldy grocery lists and cooking new recipes each night. I dreaded grocery shopping, and felt guilty about the amount of unused food I ended up throwing away. The good news: there is a better way. I’ve finally ditched complicated meal planning in favor of a simple, streamlined system, and I've never looked back. Today I'm happy to share 5 simple steps to help you ditch the complicated meal plan and still eat healthy, beautiful food every night of the week. Here's how . . .
but first, grab the free simplified grocery list! A million ingredients weigh you down and clutter your fridge and pantry. Plus, extra ingredients often end up unused, resulting in wasted food and waisted money. Instead of buying random ingredients that don't work together, create a pantry of intentionally selected, mix-and-match ingredients. Like a capsule wardrobe, a capsule pantry is made of up a limited number of versatile ingredients that you love to eat, and that can be combined into a variety of easy, delicious meals. When your pantry, fridge and freezer is filled with essentials, you'll be able to buy only what you need, and know how to use what you have. We've all fallen into the trap of planning to make a bunch of complicated recipes each week, only to find that we're too exhausted halfway through the week to be able to follow through. Instead of trying to plan a different set of complicated recipes each week, try flipping the script to think instead about recipe building blocks. Recipe building blocks, or the Essential Six, are the essential components of any recipe: sauces, protein, cooked veggies, raw veggies, grains + bases, and toppings + extras. Thinking in terms of building blocks simplifies planning and streamlines cooking, allowing you to take full advantage of your capsule fridge and pantry. Once you start thinking of meals in terms of the Essential Six, you'll be able to effortlessly combine them into an infinite number different meals. Think bowls, tacos, pasta, salads, and stir-frys, just to name a few. Plus, using the Essential Six method allows you to efficiently shop, plan and prep, without wasted time or money. Traditional meal planning is often too rigid and doesn't leave room for flexibility within any given week. To create a meal map, simply select a meal type for each day you plan to cook. So, instead of planning for individual recipes, think about mapping a few meal types, such as tacos, pasta, bowls, stir-frys, and salads. Then, once you’ve decided on meal types for the week, check your Capsule Pantry to see what you have on hand. From there, make a loose plan for how you'll mix-and-match the Essential Six. Create a quick grocery list to round-out what you have on hand, and you're good to go. Want to give try meal mapping in action? Put together a streamline process for creating a cohesive Capsule Pantry that works with the Essential Six so that you save time and have fewer decisions to make when it comes to getting dinner on the table.